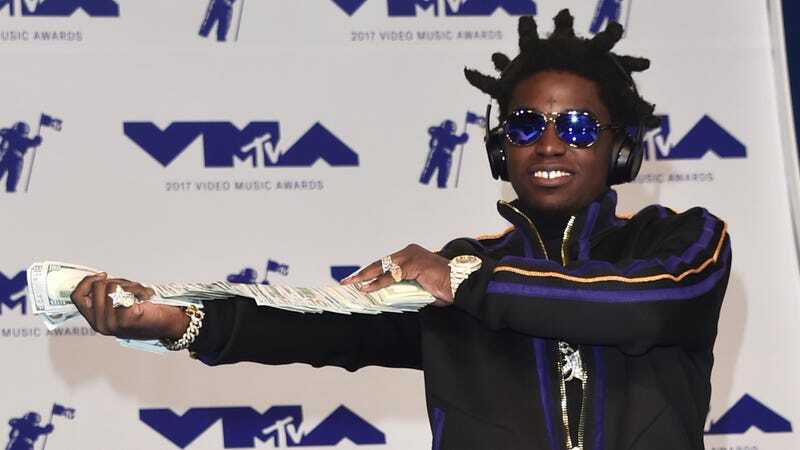 On Thursday, Kodak Black, the Florida-based rapper indicted on first degree charges of sexual assault last fall, was arrested on seven charges: two counts of possession of a weapon or ammo by an adult felon, one count of grand theft of firearm, possession of cannabis over grams, neglect of child without great bodily harm, and two counts of probation violation, according to the Broward county inmate database. Black, born Dieuson Octave, appeared to livestream the arrest on Instagram. The poorly shot footage doesn’t show too much (shown below,) but you can hear a disagreement between Kodak Black and a police officer who asks to take possession of the rapper’s phone. The brief footage can be a hit difficult to stomach, but it isn’t the first of its kind, as up-and-coming “Gucci Gang” rapper rapper Lil Pump livestreamed a police encounter while getting kicked out of a hotel in December of last year. This isn’t Kodak Black’s first arrest, or his second, or third. The 20-year-old rapper has spent most of his career in legal limbo: In 2015, he was arrested on charges of battery, false imprisonment of a child, marijuana possession, and robbery. In 2016, he was arrested on charges of sexual battery in South Carolina and still hasn’t gone to court over those charges. In early 2017, he was found guilty of violating his house arrest, which caused him to be in jail during the March release of debut album, Painting Pictures. Because Kodak Black was on house arrest during the time of his arrest, the outlook of the rapper getting out soon doesn’t look great. We’ll update as the story develops.